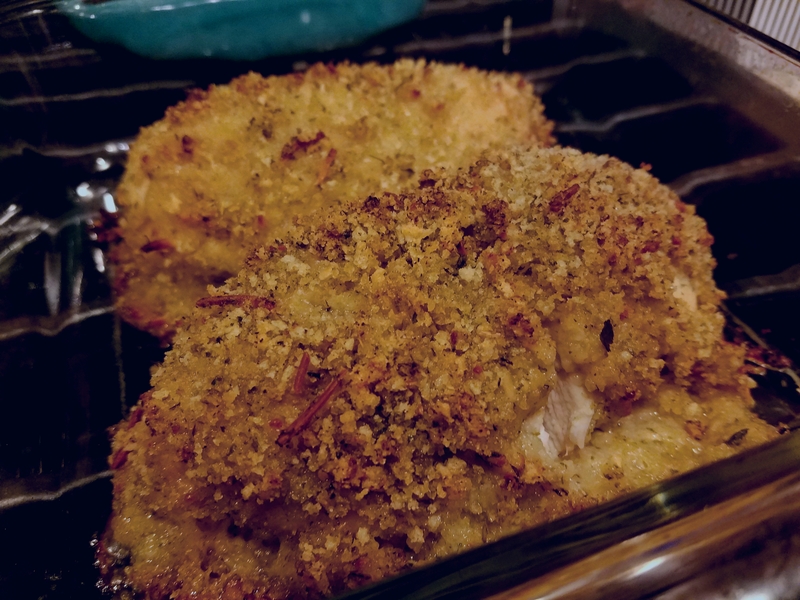 Today’s Try it Tuesday recipe, Angel Pat’s Chicken Dijon, was actually shared with me from my MIL who received it from my sister-in-law, Janeen. I reached out to Janeen to be sure she was okay with me sharing her recipe. Turns out she got this recipe from her best friend Cathy whose mother is no longer with us. Janeen responded letting me know all her friends call it Angel Pat’s recipe. She was a lovely woman who is greatly missed. All her friends who have this recipe love it. So here it is my friends, Angel Pat’s Chicken Dijon. This Chicken Dijon recipe is one of our favorites. When I make it, I like to do one or two extra chicken breasts and use it cut up in salads the next day. Start by melting together in a saucepan one and 1/2 cubes of butter, ½ cup of Dijon mustard, and 1 1/2 cloves of garlic. When melted allow to cool and whisk together with a wire whisk. In a separate bowl mix together three cups of panko bread crumbs, parsley, and 1/2 cups of parmesan cheese. 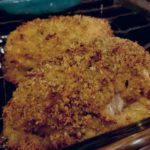 Dip the chicken breast crumbs, in the mustard mixture and in the bread crumbs again, repeating until all chicken breasts are covered. Refridgerate two to 24 hours. Bake covered in the oven at 350-degrees for 45-60 minutes. Sprinkle with parmesan. Cover except for the last 15 minutes. Optional – serve with one part dijon, two parts mayonnaise. In a large bowl mix the panko, parsley and parmesan cheese. Set aside. In a saucepan, melt together 1 1/2 cubes of butter, 1/2 cups of dijon mustard, and 1 1/2 cloves of garlic. Allow to cool and whisk together with a wire whisk. Dip boneless, skinless chicken breasts in crumbs, mustard, and crumbs again. Put in a 9x13 inch dish and refridgerate two to 24 hours. Bake at 350-degrees covered 45-60 minutes. Uncover in the last 15 minutes and sprinkle with parmesan cheese. Bake an additional 15 minutes until golden brown. Optional: serve with a sauce made from one part dijon to two parts mayonnaise. Note: I have cut the butter down to half a cube and it still tastes just as fabulous! Adding to my ‘to-be-tried’ list. Thank you for sharing my Mom’s recipe – truly the best recipe ever! The best part about this recipe is that you can prepare a day ahead, so all you need to do on the day of entertaining is to put the dish of deliciousness in the oven! !